The Forum presents this award annually to honor an individual who has served and worked to improve the condition of the Arkansas River in southeastern Colorado. 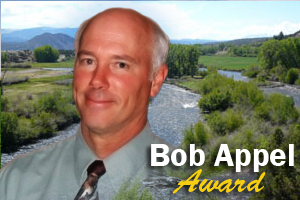 The award is in memory of Bob Appel who, as Coordinator for the Southeast Colorado RC&D Council, tirelessly provided leadership for the Arkansas River Basin Water Forum. Past winners of the Bob Appel Award are asked to serve as the selection committee for future recipients. Criteria: This award is meant to recognize someone who has helped to promote the best management practices in the usage of water in the Arkansas River Basin. Their efforts may include contributions in the general areas of development, preservation, conservation and/or leadership. The ability to reach out to as many constituents as possible, and cooperation and consensus building, is an important aspect in the consideration of this award. Other considerations include, but are not limited to, the nominees length of service in the area of water resources, the impact of their accomplishments, and their respect within the water community of the Arkansas Basin. Guidelines: Upon receipt of all nominations, a committee will review them and the recipient will be announced at the Forum. Nomination Process: Nominations should include a thorough description of why the individual is being nominated as well as any testimonials or letters of support. If you wish to nominate someone, please review the guidelines above, compile your nomination and support letters and return them in one packet before the deadline. 2005 – Mike Conlin - As the coordinator of the Lake County Open Space Initiative, Conlin was recognized for bringing local, state, and federal partners together to preserve 7,600 acres of ranchland near the Arkansas River headwaters. This area is highly regarded for its important for its recreational, wildlife, historical, and aesthetic value. 2006 – Denzel Goodwin - As a Fremont County Rancher, Goodwin has a storied history of involvement on water issues throughout the state dating back 50 years in the Arkansas Valley. He was integral to the formation of the Fremont County Water Users Association in 1956, later bringing one of the earliest groundwater cases to trial under the auspices of the association. In 1979, Goodwin helped to found the Upper Arkansas Water Conservancy District, serving as its chairman for 25 years. He later served for 16 years on the Board of the Southeastern Colorado Water Conservancy District. 2007 – Paul Flack - was recognized for his years of work on projects up and down the river. As a state water expert and hydrologist for Colorado State Parks, Flack was also instrumental in organizing the Arkansas River Basin Water Forum from its inception. 2008 – Reed Dils - An outfitter from Buena Vista, Dils has spent more than 30 years working on both recreational and environmental issues associated with water, originally as one of the first to represent the fledgling whitewater rafting industry on the Arkansas River. In the mid-1980s, he was involved in the formation of the Arkansas River Headwaters Recreation Area, and subsequently helped to develop the voluntary flow program for the Upper Arkansas River in 1990. Dils was also instrumental in forming the Buena Vista State Wildlife Area Habitat and Access Improvement Project. He was a founding member of Collegiate Peaks Anglers Chapter of Trout Unlimited. He has also served on the Southeastern Colorado Water Conservancy District, Colorado Water Conservation Board, and the Arkansas Basin Roundtable. 2009 – Carl Genova - As a farmer for more than 50 years, Genova has been a longtime advocate for agricultural water rights. He was recognized for his work on the winter water storage program, which he regards as his most significant accomplishment. Genova served on the Arkansas Valley Ditch Association (1970-1990), as a board member of the Bessemer Ditch for 38 years, and the Southeastern Colorado Water Conservancy District for 20 years. Genova always was appointed by Gov. Roy Romer to the Arkansas Valley Compact Administration (1993-1997). He was also president of the Pueblo County Farm Bureau (1969-1970) and a member of the Colorado Cattle Feeders Association and Colorado Water Congress. 2010 – Allen Ringle - served as the longtime superintendent of the Colorado Canal and Twin Lakes Company. He was honored posthumously. Ringle had a hand in water decisions in how the Arkansas River was operated from Twin Lakes in Lake County to farms in Crowley County over his 30-year career. He started with the companies in 1981, just a few years before Aurora and Colorado Springs completed their purchases of the vast majority of shares on the Colorado Canal. By that time, most of the Twin Lakes system had already been purchased by various municipalities. “Allen would be humbled,” said Scott Campbell, president of the Twin Lakes and Colorado Canal companies, in accepting the award on behalf of Ringle’s wife Carol, two children and grandchildren. “Allen loved what he did.” Ringle’s greatest asset was his knowledge of the Twin Lakes and Colorado Canal systems, which include Lake Henry and Lake Meredith in Crowley County, as well as Grizzly Lake and Lost Man Reservoir on the Western Slope. 2011 – Bud O’Hara - water resources division manager for the Pueblo Board of Water Works, “has walked this basin literally from top to bottom and even across the Continental Divide where an important part of the water in this basin is imported from,” said Phil Reynolds in presenting the award. O’Hara joined the water board in 1977 as an engineer, and began working in water resources in 1982. A division devoted to water resources was formed in 1986. While gaining substantial supplies of water for Pueblo, O’Hara also worked to see that the needs of everyone, on both sides of the mountains, are met. Some of the professional associations O’Hara has joined and helped lead over the years include the Colorado Water Congress, Twin Lakes Reservoir and Canal Co., Colorado River Headwaters Forum, Busk-Ivanhoe System, Front Range Water Utility Council and the American Water Works Association. Reynolds called O’Hara a “gentle giant of the river” and shared a story that illustrates his character. 2013- Steve Witte - Division 2 Engineer for Surface Water, joined the Division of Water Resources in 1979, and has been division engineer since 1988. During that time, he has dealt with some of the most vexing problems of water administration on the Arkansas River. Most defining his career has been the Kansas v. Colorado federal lawsuit, which was filed in 1985 and was finally settled by the U.S. Supreme Court in 2009. Witte still serves as the secretary of the Arkansas River Compact Committee, which meets annually to work out differences and assure compliance between the two states. During his tenure, the Arkansas Valley has seen new restrictions on well pumping and in ensuring surface water improvements like sprinklers, drip irrigation and ditch lining do not increase water consumption. He also has had to monitor changes in water rights after Pueblo, Colorado Springs and Aurora converted agricultural rights to municipal uses. Most recently, he has managed split river calls during difficult drought periods. 2014- Greg Policky - Greg Policky has worked for over 20 years helping to ensure improvement of the Arkansas River’s wild brown trout fishery, habitat improvement, performed aquatic education for schools, establishment and monitoring of quality fishing regulations, recovery of native cutthroat trout, protection of stream flows, and support for water quality standards. His superior professional abilities and his high level of achievement have been recognized by his peers, other agencies, conservation groups, area educators, commercial businesses, and the public. Most recently his tireless work for the protection and enhancement of the Arkansas River fishery has contributed to the designation of the Arkansas River, from Leadville to Parkdale, as a Gold Medal Trout Water Fishery. 2015- Dr. Lorenz Sutherland - has worked for over thirty years in agriculture, natural resources, and water management in the Arkansas River Basin. His work has included outreach pertaining to irrigation and water management with Colorado State University Research and Extension and the U.S. Department of Agriculture Research Service and the Natural Resources Conservation Service. His Reclamation, Colorado State University, C.S.U. Climate Center, and various conservancy and conservation districts within the Arkansas Basin. 2016 - Dr. Bernard Smith - During his 30 years in veterinary practice he studied the effects on animals consuming grasses and water exposed to acid mine drainage. His research began in 1975 and the results of this research were the basis for the Upper Arkansas River Restoration Project. The Project is pioneering a Natural Resource Damage Settlement process (the first in the country), that is currently restoring 11 miles of the Arkansas River and 5 miles of the Lake Fork of the Arkansas River in Lake County. 2017 - Gary Bostrom - is on the board of directors for Southeastern Colorado Water Conservancy District and the City of Colorado Springs Parks and Recreation. He recently retired from Colorado Springs Utilities as the Chief Water Services Officer where he was responsible for all water and wastewater operations. With over 35 years of experience within the water industry, he was an integral contributor to the careful management of the Arkansas River basin. His career has spanned a variety of leadership roles from water supply acquisition, water and wastewater infrastructure planning and engineering, and developing regional partnerships. 2018 - Ken Baker - Through the leadership of Ken Baker and Denzel Goodwin, the citizens of Chaffee County and western Fremont County formed the Upper Arkansas Water Conservancy District in 1979 and included Custer County in 1982. Ken became the first manager and legal consultant for the UAWCD. During his career as the manager and legal council for the UAWCD, Ken was instrumental in developing the District into a leader in protecting water for the Upper Arkansas Basin. He developed and established the first of a kind "blanket augmentation plan" in Colorado, a unique administrative process for augmenting domestic, municipal, and commercial structures. Today this augmentation plan protects water rights from depletion impacts in nearly a two-­million-acre service area in the Upper Arkansas Basin. Ken continues to actively serve the water community as a consultant to the UAWCD especially as an advocate for the protection of water resources in the Arkansas Valley on legislative issues.